I can no longer focus on a thought for long – can you? Is a short attention span really as bad as often suggested…? I don’t think so. Maybe working professionals can adapt to exploit this emerging behaviour pattern? My attention span has fallen over the last few years. It’s a fact. Earlier I could focus and concentrate at length, now I struggle. With so much happening in today’s multi-media, always-on world if something fails to catch my attention in the first few seconds, I just drop it and jump to the next – and even then I end up with so much that I still can’t find time to look at. Some research puts the blame on our growing use of smartphones and connected networks, others on the never-ending information overload. Whatever the cause, the effect can’t be ignored. While I have found little medical validation to support this claim and hence decided that it’s premature to give up on my digitally-connected lifestyle, it certainly opened my mind to accept that I am now doing many things differently. And since the verdict is out on whether it’s good or bad, my actions are contradictory. At one extreme, I am using yoga and meditation to build concentration; on the other I am developing new operating patterns that fit better with a shorter attention span. But, if we stop for a moment – we all know (deep down) that hardly anyone reads big communications diligently and much of what is said is often ignored… We also know that if the key message is clear then we can ‘capture’ it simply. It’s only when we lack clarity that we waffle… and we have all seen that structuring information into multiple, easier-to-digest, pieces helps present the big picture much better. Let’s say we succeed in getting the information broken down. Smaller pieces work well with our reduced attention spans. We don’t have to wait to free-up time; instead we can pick up chunks to fill in time-windows. We can cover a lot more in a shorter time. We can start by focusing on the key highlights – and only delve into details for areas that really deserve attention. And we can always create time for that. We can become better at filtering and prioritising – and hence act more effectively. The shift is to move from quantity to QUALITY. The shift is to move from activity to RESULTS. The shift is to move from management to OWNERSHIP. 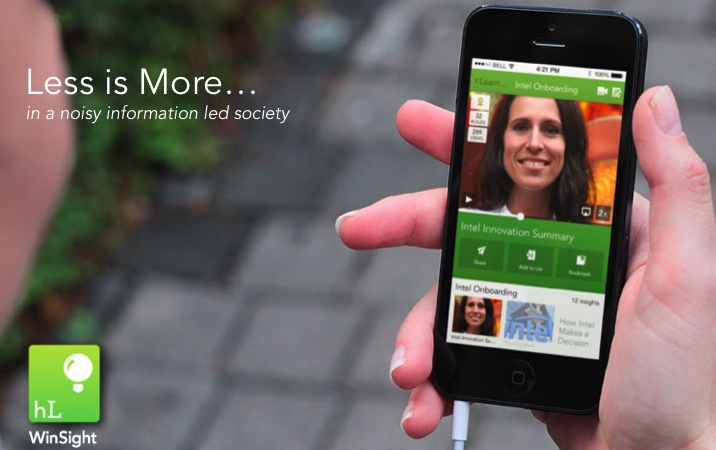 Through our innovative use of structured mobile-video, we at humanLearning have pioneered this change. Our platform ‘WinSight’ organises professionals to craft clear messages – quickly & easily – in short (30-60sec. max. ), segmented, templated videos. We can now exploit small time-windows – we have tried to capture our messages as we walk out of a client meeting to the parked car, sometimes as we wait for our turn in a queue, sometimes as we travel in the train or the underground, but quite often as we walk the busy the streets. All our communication has become near real-time and yet is available asynchronously… it gives us all the independence of un-interrupted work-flows and flexibility from time-zones but still keeps us connected – more than we have ever been before! Our belief in ‘Less is More’ may seem counter-intuitive in the age of BigData but it can evolve into the natural way of future communication – a more human way to interface & interact. It will take time to move all the interactions to this new mantra. However, we should get started now. After all, it’s not just about survival anymore but an opportunity for working professionals to simplify their work-life by creating new, easier, quicker, more effective – asynchronous – ways of working.